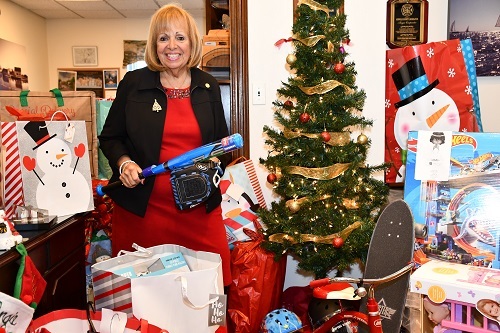 December 12th, 2018 – An outpouring of generosity from Town of Islip employees was evident this week, when hundreds of toys purchased for the Salvation Army Angel Tree Program awaited pick-up in Islip Town Supervisor Angie Carpenter's office. December 10th, 2018 – Islip Town Supervisor Angie Carpenter, Islip Town officials and Steve Castleton, NY Jets First Responder and Military Liaison surprised two Town of Islip Park Rangers at a special recognition ceremony in the Islip Town Board Room recently. Town of Islip Park Rangers Anthony LaGrasta and John Rivera were hailed as heroes in the media last month, after pulling a motorist from a freezing Islip canal. When a West Islip restaurateur heard the news, he reached out to his longtime friend, Steve Castleton who coordinates the NY Jets annual Military Day. Today, Castleton joined Supervisor Carpenter to announce that the NY Jets have invited the pair of park rangers and their families, to attend the NY Jets First Responders Night game Saturday, December 16th. December 7th, 2018 – Dozens of community groups and service organizations turned out for the 5th Annual Festival of Trees at Brookwood Hall Thursday. Thirty five Christmas trees were decorated on the lawn as part of the annual event presented by the Brookwood Hall Restoration Committee and the Islip Arts Council. Islip Town Supervisor Angie Carpenter was joined by Town Councilmen James O'Connor, John Cochrane, Jr. and Town Clerk Olga Murray, along with Suffolk County Legislators Steve Flotteron and Tom Cilmi. “The Festival of Trees brings the community together in an age-old tradition, putting everyone in the holiday spirit,” said Supervisor Angie Carpenter. A LIVE DJ played Christmas Carols and a performance of Annie's Hard Knock Life entertained the crowd.